If you want to output a simple text file from SPSS Statistics data, you have a number of options to choose from, as shown in the following figure. The options for creating a text file. The first two options are whether to use tabs or spaces to position characters on the page. This choice can be important because alignment is crucial to some data layouts, and programs that read the text files may have different tab settings and change the appearance of the output when it’s displayed. The options for creating a Unicode file are the same as those for creating a plain-text file. The Unicode output is in the standard encoding format of your choice — either UTF-8 or UTF-16. You would want to output text in one of these formats only if you have a program that needs one of those formats for its input. Tables output as text use certain characters to define the cells in which data items are shown. You can select any characters you want to act as separators and draw the borders, or you can accept the default of the minus sign and vertical bar, as shown in the figure. (The vertical bar is a standard keyboard character, usually on the same key as the backward slash. It sometimes looks like a vertical line broken in the middle.) 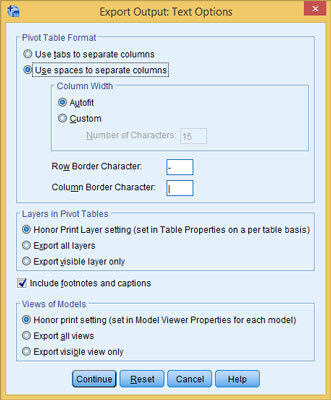 If you’re outputting tables, you can choose a maximum cell size or just use the default Autofit option and let SPSS decide the number of characters that will fit in each column.